A new event to increase your chances of obtaining Omega monsters! 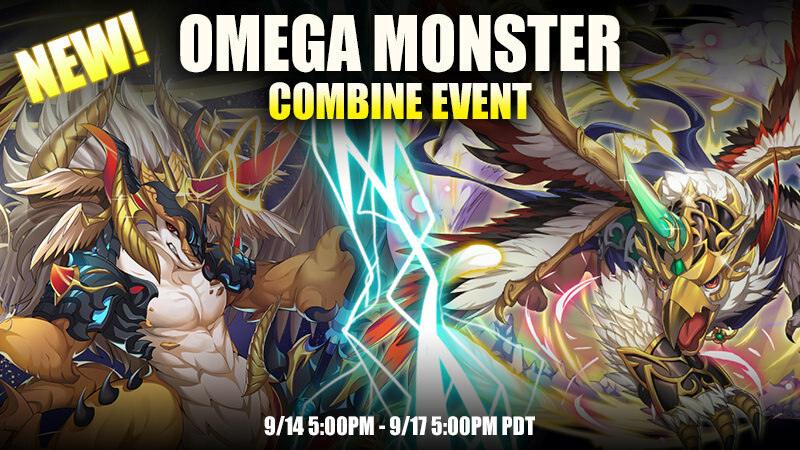 During this event, players who combine Infinite - Eternal monsters for Mystic - Divine monsters will receive a higher chance at obtaining an Omega monster of a higher tier by using Jewels! 10% chance to receive an Omega of the higher tier. Do not receive Omega monster of higher tier. Guaranteed a higher tier monster. Chance of Omegas will increase by 1% per failure. Upon successfully obtaining an Omega monster, the chance of Omega will drop back down to 10%! Jewel costs will vary depending on the monster tier used to combine. The event combine can be accessed via the "Omega Combine" button from the Combine screen. It is already useless, because you dont need a combine event when you use jewels, its 100% chance to combine regular monsters into regular monsters. "During this event, players who combine Infinite - Eternal monsters for Mystic - Divine monsters will receive a higher chance at obtaining an Omega monster of a higher tier by using Jewels!" I was hoping it will be good, but im skipping this money hungry event, totally not worth it. I will rely on base 2% omega combine chance rather. We all want a 35% ce. No one want to drain thier jewels on combines. Like seriously what are you guys thinking? We are gonna drop 90,000 jewels for omegas? Get real. The omega ce+ regular CE was good enough. Your wasting your time and money on this system that will not be used. True this omega combine event is useless i no will waste my jewels for maximum immortals that worth 0 monster points i want normal combine event that i can combine few immo+ for monster points and more ragnaroks i no need omegas but i would like to see new tier soon a lot players talk about something "Royal" new tier so whats that? Mmm.. for highest tier, it will most likely stay at Ragnarok for awhile. a lot players talk about something "Royal" new tier so whats that? Last edited by Concept; 09-13-2018 at 12:10 PM. 1200j for immos n 0% if we decide not to jewel it its pretty darn greedy!! !